A snowmobiling accident left Jered Chinnock paralyzed from the middle of his torso down. He didn’t think he’d ever walk again. But now, thanks to pioneering research, he is taking steps toward reaching that goal and others. One beautiful winter day in February 2013, Jered Chinnock's life changed in an instant. Jered, an avid outdoorsman, was snowmobiling with friends and family when he was thrown from his machine and hit by another snowmobile. The accident left the active, independent young man with several broken ribs, a punctured lung and, most significantly, three spinal fractures. That particular injury damaged Jered's spinal cord, leaving him unable to move anything below the middle of his torso. "I didn't think I'd walk again," he recently told the Archery Trade Association. But that changed earlier this year, when Jered became the first patient at Mayo Clinic to benefit from an ambitious research project. The goal of the initiative was to find out whether intense physical therapy, combined with electrical stimulation on the spinal cord, can help paralyzed patients regain the ability to move. Jered's goal, among other things, was to get back to the things he loved. That’s among the goals of Mayo Clinic researchers as well. 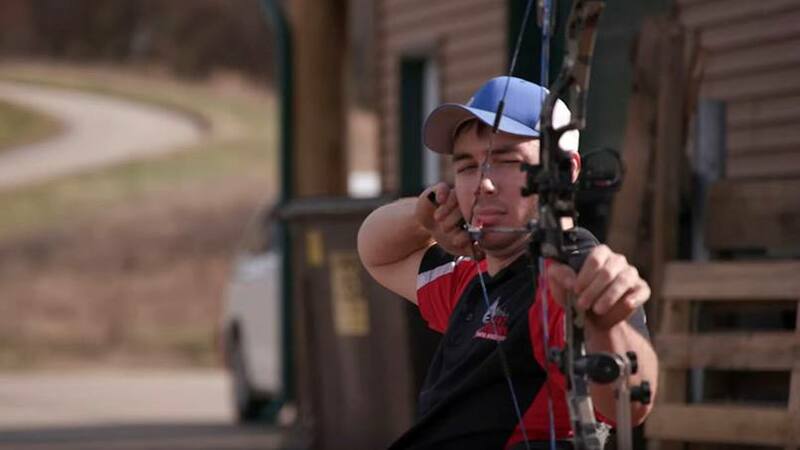 For Jered, that includes bowhunting, which he said helped fuel his rehabilitation sessions. And this spring, after 22 weeks of physical therapy and innovative, high-tech neurosurgery to implant a small, computer-controlled stimulator, Jered is making small strides. The first time the stimulator was turned on "was almost mind-blowing," Jered says in a Mayo Clinic News Network video. "Right away I was able to move my toes" — something he hadn't been able to do since the accident. Other milestones quickly followed, as Jered "was able to control his muscles while lying on his side, make steplike motions while lying on his side and standing with partial support, and stand independently using his arms on support bars for balance." Those strides weren't mind blowing just for Jered. His accomplishments "went beyond our expectations," says neurosurgeon Kendall Lee, M.D., Ph.D. Dr. Lee, director of Mayo Clinic's Neural Engineering Laboratory, tells the Star Tribune that the results were a "major breakthrough." And while that's exciting to researchers, it's something else altogether for Jered and patients like him. Though he takes his progress "day by day," Jered tells the folks at the Archery Trade Association, he's now "definitely aiming for one main goal, and that's walking," which seemed impossible not so long ago. In the meantime, he's relishing the changes that have already come. Changes that are helping him return to the life — and the activities — that defined him before his accident. "Bowhunting, to me, means everything," Jered says. "It's who I am, and it's what I do." And it's one more thing that's improved since being enrolled in the study. "Before, I couldn't hold my bow back for very long, because I'd start to fall over from holding all the weight out with my arm extended," he tells Archery Trade Association. Therapy has increased his core strength, giving Jered better balance and control. "Before I even shot with [the stimulator], just sitting in my chair on the edge of a mat, knowing that I can hold myself up better made me excited," he tells the publication. "And I definitely shoot a heck of a lot better." Sounds like a bullseye to us. Take aim and leave your comments below. Then, you can use the handy social media tools atop this page to share this story with others.